It’s The Wrong Anniversary, Gromit! Today is May 25th, the anniversary of the original premiere of Star Wars in Los Angeles. This comes only three weeks after the designated Star Wars day, May The Fourth, and only a few days after what was, this year, the thirtieth anniversary of the release of The Empire Strikes Back. However, there is some friction in nerd circles because the 25th of May is unofficially established as Towel Day, a day to memorialize Douglas Noel Adams, despite not having much of a substantive connection to Adams’ birthdate, the number 42, or various other potentially relevant dates. It’s a muggy, hot New England day as I type this, and the heat is trapped inside my walls, wilting the the room and rendering any faint, hesitant climate controls (and perhaps my editing abilities) almost completely ineffective. It’s the kind of day where a towel to wipe down perspiration would not go amiss, and a beach towel would be even more advantageous, providing it came with a beach and a pleasingly cool ocean to go along with it. Despite being spoiled for choice when it comes to commercially available memorial towels, I’m not flying my terrycloth colors today. No, I provide you with this conurbation of links not just to close tabs on my browser, but also to muse on this nerd nexus of dates, observances, and inspirations all in close proximity. It felt even more packed with inspiration that it ought to have due to two articles that filtered through my feed yesterday and made me wonder if it was Wrong Trousers Day as well. The first was an epistle to Feathers McGraw’s highly technical, inventive, and efficient casing of a locked, security-laden museum, and the second was that the astronauts currently aboard the space shuttle Atlantis were woken by NASA playing the claymation duo’s theme tune. Not wholly unusual as coincidences go, but sufficient to make me wonder if maybe I’d marked down the date for Wrong Trousers Day — ahem — wrongly (I hadn’t, it’s still on June 25th this year), and that all of these geek favorites were all, in fact, cheek by jowl in May competing for some small slice of the fanboy love. I simply wasn’t sure that Hitchhiker’s, Star Wars, and Wallace & Gromit could all demand attention so close to each other and not result in fractious behavior. But I needn’t have worried. Aardman, Adams, and Alderaan all get their due space for recognition, allowing us not to have to worry about which allegiance (or Alliance!) to choose for our tweets, status updates, or the like. There is enough room in our hearts and enough room on our calendars. But that calendar keeps ticking on. Today is still one more anniversary: that of Frank Oz’s birth, and he’s no spring chicken (or blue eagle) anymore. But then again, if Empire came out thirty years ago, not even most of its fans are that young any more, let alone its creators and performers. As Harrison Ford recently said, “I thought [Star Wars co-star Alec Guinness] was an old man: an old, wonderful actor. [But] I did the math. I figured out how old he was in Star Wars, and he was about six years younger than I am now.” Ford is 67, a mere year younger than Frank Oz. Alec Guinness was 86 when he died, Jim Henson was 53, and Douglas Adams was 49. It may all have been a long, long time ago — whether in a galaxy far, far away or in a field in Innsbruck — but we carry these men and their fantastic creations with us still. A hoopy frood always knows where his towel is, sure, but I’d prefer simply to know where my youthful inspirations are, and that they’re still here with us, always. There is a blogging divide between original content and zeitgeist participation. Some people write on blogs — and I recognize that this is a gross generalization, but there are two types of people in the world: those who divide the world into two types of people, and those who don’t, and I tend to fall into the former category — are attempting to record a particular perspective, a written oral history, if you will. Not as entitled in concept as a vanity press, but with a solid belief that the observations of the common-and-garden individual have merit and resonance. These people speak their minds, sometimes in order to order their thoughts, and sometimes to clarify a personal position, and sometimes simply to record the now. The other side of the blogging spectrum consists of popular affirmation, the participation in linkmanship. One states an opinion or a point of view by linking to a similar opinion or a contrary opinion, basing one’s contributions upon the preponderance of available opinion. This is then codified by the comments and trackbacks and linktos that given evidence that the opinionist is not alone, but part of a swarm of thought on the matter of the moment. As a self-declared iconoclast, as someone who will compromise by saying that, well, at least we are all part of an archipelago and so I am too an island, I find little use for the latter technique. So I was immediately wary of my instinct to blog about Saddam Hussein’s comments last week that he would “crush the heads” of his enemies. 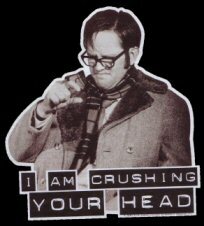 The obvious parallel to the somewhat annoying Kids in the Hall catch-phrase leapt to mind… as did the awareness that sure the blogosphere would be rife with the reference. How surprising to find that a Google Blog search produced a scant twenty-five results and a BlogDigger search only fourteen. But still, my initial impulse was quelled by the feeling that it was too obvious, too ordinary to put to pixel. Not so with this second news piece. Less of a lark and more of a piece of personal… something. Statementship. This item surpassed a need for communal temperature-taking and became more about me! Therefore: excellent blog fodder. Back in March, I found myself interning at a public high school in western Massachusetts and was shocked to realize just how long it had been since I had uttered the Pledge of Allegiance. With all the recent hoopla over the “under God” portion of the Pledge and the fervent opinions about whether it belonged (depending upon whether one considers the act of adding the phrase to the Pledge to be more political and temporal than pure, or whether one believes that the United States is a Christian nation), I fixed my opinion about the issue based upon my own desire to continue to enforce the required separation of Church and State. But I had forgotten the chilly ring of a couple of dozen voices, chanting together, dully reciting without thinking about the words they intoned. A sudden realization that “the Lord’s prayer” was a declaration that I desired God’s will to be done on Earth had driven me from even again attending church services. I felt really uncomfortable standing in a room of students unthinkingly swearing fealty to the vicissitudes of State. I had attended a high school where the Pledge was not recited, and I was suddenly awash with a feeling of relief that I hadn’t been asked to participate in such mass programming. So when I read that a school in North Carolina had quietly, perhaps intentionally, stopped requiring the recitation of the Pledge, I was highly intrigued, especially now that the state has joined “37 [others to] require schools to include the pledge in their daily schedules”. Which is in and of itself a sticky wicket, considering that the Supreme Court has ruled that requiring the Pledge “violate[s] the Fourteenth Amendment’s requirement of due process and the First Amendment’s requirements of religious freedom and free speech upon the state.” In fact, a school policy that required a student to simply stand quietly during the Pledge but otherwise not participate was changed in 1998 when faced with a lawsuit by the ACLU. However, it’s no longer 1998. It’s now “after 9/11”. Which means that according to the previous link, Nebraska law has reinstated a 1949 “patriotism law” that requires, among other things, that students be instructed as to the “dangers of Communism”. It is generally considered that the words “under God” were added to raise an upright middle finger to the Godless Communists. And now that we have a new enemy, also considered to be “Godless” by our nation of fatuous Christmas-and-Easter Christians, such blatant line-in-the-sand allegiance is once again required. I tend to find myself agreeing with Dan Bern: we can’t move on, socially or politically, until the children of the Cold War and their engineered minds wither and die. I should be strong, but the culture of self-actualization says otherwise. Be true to yourself, it says, be at peace with who you are. Old world thinking instead claims that through will power we shape our existence. Instead of making peace, we used to struggle. “All progress is made by unreasonable men,” quoth Bernard Shaw. That sort of thing. But, instead, I am soft and the product of my culture (see! that in and of itself is a self-actualizing statement), and find it difficult to rail against the dying of the… something. Pride, perhaps. What is all this musing in aid of? Arachnophobia. I have found myself, as time passes, being increasingly okay with my squeamishness towards chitinous scrabbly things. I am no longer embarrassed about it. I don’t need to display a show of strength and fortitude, I don’t need to be macho. Instead I can shriek and cringe and shudder at the thought or presence of something with far too many legs and an alien physiology. And I can lash out in revulsion at their fear-inducing structure and squash the hell out of them with impunity, despite the fact that the collapse of their exoskeleton and the subsequent liquidation of their organs does little to make the revulsion go away. However, this acceptance has also allowed the fears and feelings associated with coming into contact with such arthropods to magnify. By allowing them to occur, by not repressing them, they now hold full sway. Which becomes a problem when, as happened to me last week, one is in the middle of a long stretch of highway and suddenly notices a spider walking merrily across the inside on the windshield. Such a situation causes instant fear-based tension, revealing itself in symptoms that would look to any of my fellow highway travelers like a particularly rigid case of white-knuckled white line fever. Because, I needed to do three things simultaneously: 1) Not be overcome with a violent case of twitches and shudders, all of which would require me releasing my hands from the steering wheel, 2) finding an exit, quickly, and 3) following the movement of the spider so that when I finally pulled off the highway I could kill it with extreme prejudice. It’s difficult to focus on a small, dark creature on the inside surface of a transparent object you’re also supposed to be looking through, and so number two was difficult, but not nearly as difficult as number one, because the more I focused on the spider, the mode massive shudders kept coursing with pounding tides up my spinal column. Once on the side of the road, I discovered that due to the sloped glass of the windshield, I had difficulty squashing the little bugger, and so tried to transport him from the car so that I could jump up on down on him once he was on the large, flat expanse on non-sloped pavement my car was pulled over next to. But in removing him from the car, there was a moment when I lost track of him. He was no longer on the windshield, and not longer on the object with which I was removing him from the car, which meant he was either safely outside or somewhere on the floor of the car, or someplace generally hidden away. I squished another passing spider that had nothing to do with the proceeding, simply out of frustrated retribution. But this has not prevented me from interpreting every stray brush of hair, fabric, or whatever inside my car as, “AAAAAHHH! AAAAHHH!! THE SPIDER”S BACK! AND IT’S ON ME!! !” My own little pathetic personal version of post-traumatic stress disorder. 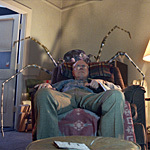 In attempting to allay this syndrome, I was listening to Phil Jupitus’ excellent stand-up bit on spiders from his Quadrophobia album, but all his talk of spiders and wriggling legs and the like just made the onset of the Phantom Arachnid (Not Insect) Contact attacks more frequent and more vivid. I think it’s time to go back to steely resolve, and none of this twenty-first century “be true to your pansy instincts” nonsense. The picture to the left is that of the Sony Mavica camera. I’m in love with this camera the way I never have been with a digital camera. And why? Because it’s not especially good. It’s got little in the way of features, and the best pictures it takes are of a 0.8 megapixel resolution. And it’s the size of a late-nineties digital videocamera, the first ones that you’d see parents at weddings and graduations holding away from their bodies as they squinted at the tiny viewscreen. There was an odd zombified quality to their perambulation as they wandered about, holding the camera with stiff arms away from them and trying to frame whatever it was they were trying to capture without jiggling the whole device. One loses the fine motor control of stability when one is relying on that many muscle groups. However, this camera takes pictures and saves them immediately to a floppy diskette. What a great idea! The school library at which I’m currently interning has two of the little buggers in their A/V closet, and my mind is blown with the possibilities! No more messing with cords or adapters or mini-USBs or flash cards… pop the disk into the computer and post the images on the web or paste them into your word processing document. Boom. Done. What a great thing to give middle schoolers who are writing a class newspaper. It may run about $150, but it doesn’t feel like a big deal because you can’t get great pictures from it! It’s so hard for me to take pictures because I’m precious about features and settings and composition and light and shutter speed and blah, blah, blah. But with a camera like this, a camera that saves images to something as cheap and as notoriously unreliable as a floppy, well, taking pictures with a camera like that is easy, because one can’t take it seriously. …and it wasn’t until three hours later when I got home that I remembered that I own a Mac, and I haven’t had a floppy disk drive since 1999. 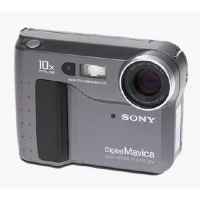 So while I’m still in love with the Sony Mavica, it’s doubtful that I’ll be picking one up any time soon. Driving home from work yesterday I was listening to All Things Considered, and I stumbled upon a story that was steering wheel-poundingly fearsome and hilarious simultaneously. A man named Hamilton Banks has, after years and years of being a lifelong opera fan, finally combined his love of music with his adoration of the principles of the Power of Positive Thinking as espoused by Norman Vincent Peale, to found an opera company where he will systematically edit all the great tragedies so that they have uplifting endings. That’s right, at the end of Don Giovanni, the fear of Hell and its torments will so move Don Giovanni that he will be born again in the love of Christ and marry the girl. So as not to spoil the opera, new lyrics will be written to some of Mozart’s cheerier music featured in the earlier portions of the work, including the “Peasants’ Wedding Song”. Mr. Banks, on the other hand, is quite convinced of the purity of his exercise. He honestly cannot conceive of an audience’s desire for catharsis, leading him to say in one breath that he loves the operas of the great masters, and then in the next that maybe “if the wonderful anti-depressant drugs we have today had been available, they’d never have written those depressing endings and maybe they’d never written the whole opera.” Great! That’s what the power of positive thinking can do! 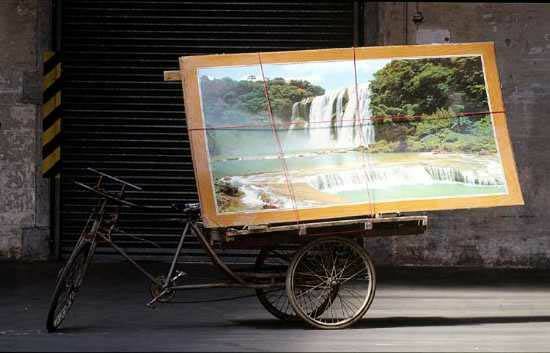 Deprive the world of Great Art! Well done, Mr. Banks for showing us the way: we need to medicate all artists out of existence! However, if one were less inclined to be outraged and want to use the Power of Positive Thinking to find something worthwhile in this ridiculous news story, it is a marvelous example of the classic syndrome of Life Imitating Satire. Some of you may recall the episode of Jon Lovitz’s The Critic where a TV executive uses digital editing to create new happy endings for films like Casablanca. That was done as a joke, as the sort of idea of which only the most boneheaded and inartistic individual could conceive. But now we know that such an individual isn’t just the fanciful, fictional comedic extreme of someone’s imagination! America strikes again and proves that not only can someone this outrageous be real, but he can also be incredibly successful! USA! USA! Providing the world with self-deluded, charismatic, ignorant bizarro-humans for over two hundred years! I was quite shocked to pass a sign for “Satan’s Kingdom State Park” in the midst of Connecticut. I had thought at first that I had dyslexed some word; perhaps it was “Santa’s Kingdom”, much like the infamous Santa’s Village in Jefferson, NH. However, upon the passage of a second sign, I realized that my eyes and brain were not, in fact, playing tricks on me. But a search of Google Maps produced no results (above right), which further surpised me. Was this perhaps not an official name? But the map of Nepaug State Park (above left) did confirm that there was a region with such a name, and an article from Legendary Connecticut informs me that there are many places in New England that bear the name or the title of the Devil. How strange that Puritan culture would have been so frequent to apportion the land to the Adversary. Unlike the traditions associated with places named for the Devil, legend and history blend together in the accounts which explain the origin of Satan’s Kingdom and Satan’s Ridge, both in New Hartford. According to legend, Satan once used the rocky gorge of the Farmington River bearing his name as his exclusive playground. Here, he and his band of lesser demons gamboled away their days and nights, until the day finally came when the Angel Gabriel blew them all away with one blast from his golden trumpet. …[A]ccording to the historical record, the Satan’s Kingdom district did, in fact, once serve as a refuge for a scattering of human beings who might easily have been mistaken for devils. Either attracted by the place’s name, or — more likely — its isolated and inaccessible location, a notorious group of “Indians, Negroes and renegade whites” settled in the Kingdom, in the last years of the eighteenth century. The first musical artist I ever seriously listened to, eagerly awaiting the release of each new album, was Weird Al Yankovic. While other kids were discovering the Beastie Boys and Tiffany, my musical diet consisted of Weird Al and Tom Lehrer. So parody is practically my native tongue. When Katie sings “We are 12 billion light-years from the edge”, she is suggesting that this is the distance to the edge of the observable universe, which in turn implies that the universe is only 12 billion years old. This is incredibly frustrating, because there are thousands of astronomers working day and (of course) night to measure the age of the universe, and the latest observations imply a universe that is almost 14 billion years old, not 12 billion. Most hilarious, even if it doesn’t scan. I actually have to agree with Mr. Singh, particularly in light of the recent article in the New York Times about the decline in elementary scientific knowledge, including the jaw-dropping statistic that one in five Americans actually believes that the sun revolves around the earth. However, the song is criminal is other important ways: it’s dull, it contains a cheekily-Asian chord pattern in the intro, and comes complete with a bizarre music video that starts as if it’s going to be structured in an homage to the classic “Powers of Ten” video, and then just goes… silly. Another bright spot in all this was the discovery of the Fixed-Gear Gallery, a series of photographs of bicycles as an art form. Thanks to Andrew Hogg for the article and John Mazzeo for the epithet. Is it real? Or is is the news? I’m not usually a fan of shlock tabloids. I have friends who were very excited about Batboy: The Musical, based upon the popular reoccurring character in the Weekly World News, and young-adult librarians have considered putting tabloids in periodical sections as an “lite” option for reluctant readers. However, in my opinion, The National Enquirer, The Globe, and the like are filled with disturbing levels of invasion into the lives of celebrities and as well as content that is borderline repellant in its overt titilation. So it is with some degree of surprise that I found the cover this the current edition of the Weekly World News to be incredibly inventive. The “Or the kitten DIES!” idea is a classic National Lampoon joke, but the graphic is well-done in the traditional part-drawing, part-manipulated-photo manner. The (partially obscured) headline about SPAM is hilarious, and I’d never really noticed the banner motto before. It’s all quite self-aware. Perhaps it really could be used by librarians in media literacy curriculum. Now that I have archives happily built into the design of the site, I now feel like I can begin having running series of related comments. In that spirit, I had a couple of earlier posts about Hybrid cars that an article in the Keene Sentinel reminded me of this morning. But now, hybrid technology seems to be heading the way of earlier technologies such as four valves per cylinder and variable valve timing. Those technologies can also be used to improve fuel efficiency, but in many instances they instead became another way of building cars with greater power and faster acceleration. Manufacturers have been downsizing the gasoline engines in some of their hybrids only a little or not at all. And some are adding the electric motor essentially as a “green turbocharger,” as Consumer Reports magazine puts it. Consider Honda. The company has two older-style hybrids — the two-passenger Insight, which the EPA says can get 66 miles per gallon on the highway, and the five-passenger Civic, which can get 51. The EPA estimates that the 2005 Honda Accord Hybrid gets just 37 miles per gallon, compared to 30 for the non-hybrid version on which it is based. According to Consumer Reports, which performs what it says are more accurate mileage tests, the actual difference is even smaller: The hybrid averages only about two miles per gallon better than the standard Accord. Before I left the apartment this morning, I briefly checked Delphi to see if anyone had posted anything to me, and noticed that The V had changed it’s name from whatever it was previously to “Panic on the Streets of London”. I assumed it was a reference to vast escapades in celebration of snaking the Olympics site from France and went on my way. However, in the midst of my morning commute to class, I heard on the news about the bombings and quickly reinterpreted what the title had signified. I stayed glued to the radio, wishing I could get to school so that I could find a computer and find out if everyone was okay. Renee Montaigne was clearly unprepared for a morning of this magnitude and did a game job, but she was a little shaky and tended to wander off on unfortunately discursive descriptions and recaps. And in the midst of all this breaking new and tense grasping at details, there came a promo for a later broadcast about the 25th anniversary of the release of the magnificent comedy film Airplane! (Yes, the exclamation point is part of the title.) And I thought, what a brilliant thing to link to on the old ‘blog. So it was a great disappointment to discover later that Jimmy Johnson, writer and artist of Arlo and Janis had thought the same thing and beat me to the punch while I was still in the car. He even has the brazen temerity to celebrate that he posted first! Feh. I’m still blogging about it, obviously, but the excitement has left the building. Bizarrely enough, however, virtually the same story was broadcast five years prior for the 20th anniversary. And, incidentally, Airplane! made it on to the AFI’s Top 100 Movie Quotations, coming in at #79 with “I am serious… and don’t call me Shirley.” It’s no “Looks like I picked the wrong day to stop sniffing glue…”, but the fact that they made the list at all would be pretty cool if the AFI had any redeeming tastes whatsoever.